Puerto Rican Nationalist Oscar López Rivera Is Released : The Two-Way López Rivera had been in custody since 1981. He was imprisoned over his connection with a militant group that fought for Puerto Rican independence and claimed responsibility for dozens of bombings. Puerto Rican nationalist Oscar López Rivera gestures as he is released Wednesday from house arrest in San Juan, Puerto Rico, after 36 years in custody. One of President Obama's last acts in office was to grant clemency to dozens of people, including Puerto Rican nationalist Oscar López Rivera. 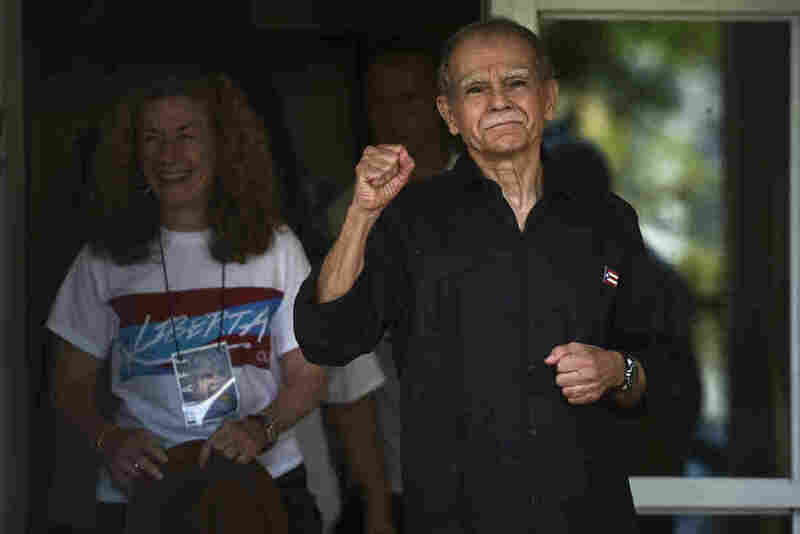 On Wednesday, López Rivera was released from house arrest in Puerto Rico. The 74-year-old had been in custody for seditious conspiracy since 1981. The clemency decision was controversial. "To his supporters, he is a freedom fighter for the cause of Puerto Rican independence. To others, he's a terrorist," NPR's Kelly McEvers noted at the time. López Rivera was part of a militant group that fought for Puerto Rican independence, called the FALN. "Between 1974 and 1983, the FALN claimed responsibility for more than 70 bombings in New York, Chicago and Washington, D.C.," Marlon Bishop and Maria Hinojosa of NPR's Latino USA have reported. "The bombings caused millions in property damage, dozens of injuries and five deaths." "The FBI had no physical evidence to prove that López Rivera set any bombs himself. So instead, he was tried for a seditious conspiracy to overthrow the power of the United States in connection with 28 FALN bombings in Chicago. "So his supporters essentially say that seditious conspiracy is, quote, 'a political crime for simply opposing the United States government.' And they say that his 55-year sentence was essentially unfair. But his opponents say that he is essentially an unrepentant terrorist." On Wednesday, López Rivera emerged from his daughter's home in San Juan, Puerto Rico, according to The Associated Press. He had been transferred there from a prison in Terre Haute, Ind., weeks after Obama commuted his sentence. "Roughly 50 people congregated in the streets outside the apartment building in San Juan's Santurce district holding flowers and Puerto Rican flags, some chanting: 'Free at last!,'" the news service added. "A group of singers from University of Puerto Rico's choir harmonized as Oscar drove past." The AP says López Rivera is expected to be honored in Chicago later this week, and as well as "at the June 11 Puerto Rican Day parade along New York's Fifth Avenue." As NPR has reported, a number of high-profile figures had called for Obama to grant him clemency, including Sen. Bernie Sanders of Vermont, Hamilton creator Lin-Manuel Miranda and Archbishop Desmond Tutu. Chelsea Manning, the Army private who leaked a huge trove of military secrets to WikiLeaks, was part of the same group of 209 people whose sentences were commuted in January. Manning also walked free today. NPR's Latino USA released an hour-long podcast on Oscar López Rivera earlier this year. You can listen to it here.